Just as she is completing her latest work of art, Elena is alerted by her landlord that she must stop living illegally in her studio. This will trigger bitter conversations with her boyfriend, confronting her to a reality she has been trying to ignore: it’s impossible to be an artist in New York without selling any work. In her search to find a place in the city and the world, Elena will face one of the greatest fears of all artists: to stop being an artist. Rafael Salazar is a filmmaker from Spain based in Brooklyn, New York. In 2011 he put his experience as a video journalist in his first short film “Camilo” (2011, 16 min) which was selected at festivals such as Urbanworld Film Fest, Gasparilla International Film Festival and London Latin American Film Festival, among others. For the last 5 years his work has orbited around the art world, exploring the creating process through the Webby nominated web series New York Close Up for Art21 organization or the use of art as a tool for social change through the web series FIELDWORKS, in collaboration with the cultural non-profit A Blade of Grass. Under his production company RAVA Films, which he co-founded with his wife Ava Wiland, Rafa has made numerous documentaries commissioned by renown art organizations such as Art21, Whitney Museum, Skowhegan School of Painting & Sculpture or Storm King Art Center. His latest short film tries to integrate his two passions: art and narrative films. “Unfinished, 2017 (MixMedia)” captures the critical but frequent moment when an artist has to confront his constant fear of stop making art. I started writing this short in the midst of my own vocation crisis, so for me was an exploration of my future as an artist/filmmaker. After spending the past six years creating short documentaries about art and the artistic process for leading art institutions – including Art21, the Whitney Museum, A Blade of Grass, and TATE – my work has captured diverse stories about the motivations, challenges and struggles of artists today. 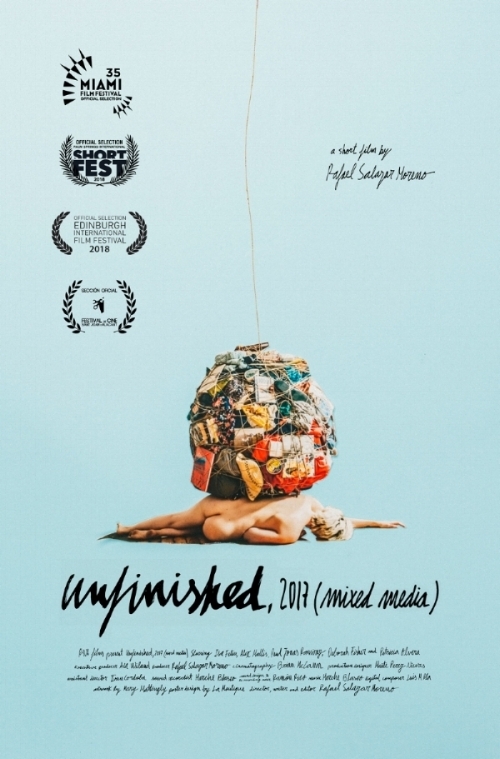 I’ve been in awe at the drive and determination of the artists that I have worked with and have sought with this film to expose the often invisible and hidden fragility and disappointment that young artists experience. This film, I hope, goes behind the scenes of many of the films that I’ve created so far, and brings to the screen the personal struggles of an artist in a moment of vulnerability, when drive becomes obsession and selfishness. I chose to feature the real artwork of Mary Mattingly to point to how we are all, consciously or not, implicated in a mass production system that is harmful to people and to the environment, and yet feels inescapable. I wanted to depict an artist torn between her political ideals and her desire to belong to an art world and participate in an art market that is inevitably entrenched in the global supply chain system her work critiques.